The bull market in U.S. stocks is now nine years old, one of the longest such streaks in history. The United States boasts many of the world’s most valuable companies, and investors have enjoyed high returns with low volatility. Yet there’s reason to wonder whether U.S. capital markets, broadly considered, are as healthy as they look. We asked this question two years ago and return to it now, with a little more data, a few more answers, but still many outstanding puzzles. 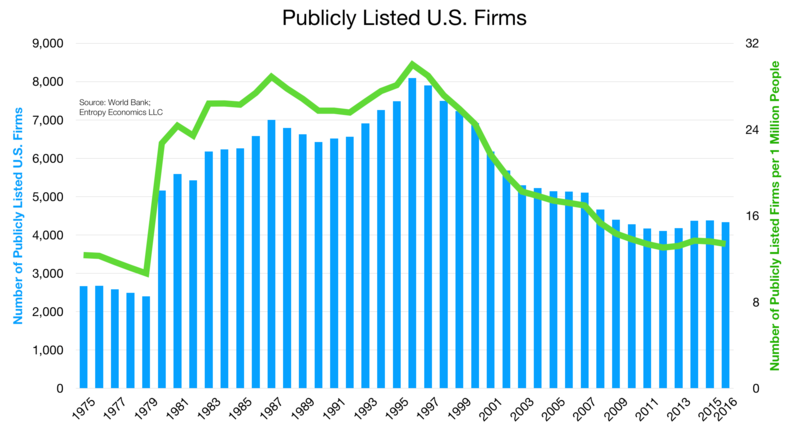 The number of publicly listed U.S. firms, for example, is just one half what it was in the mid-1990s. Depending on the type of listings counted, the number of U.S. public firms has fallen to a range of 3,500-4,000 today from a range of 7,500-8,000 in 1996. Adjusted for population, the number of publicly listed firms has dropped to 13 per million people from a peak of 30 per million. Initial public offerings (IPOs) fell after 2000. 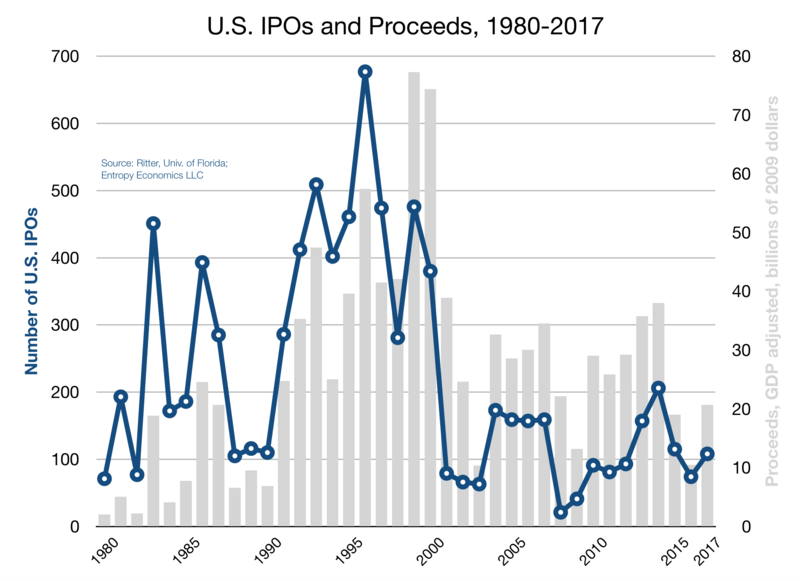 In fact, no year between 2001 and 2017 saw anywhere close to the number of IPOs in any year between 1991 and 2000. Over the past two decades, U.S. companies bought back vastly more stock than they issued. On net, according to a new paper by Craig Doidge and colleagues, companies purchased $3.6 trillion more stock than they offered. Stock buybacks are a perfectly appropriate way to return value to shareholders, but the disparity is still surprising. Sarbanes Oxley (SarbOx) and other financial rules, such as Regulation Financial Disclosure (Reg FD), are a big reason for the IPO plunge and larger delisting phenomenon. Raising the cost of going – or staying – public has had a predictable effect. Doidge and colleagues show small firms exhibit the most pronounced fall-off in the propensity to list, but they also show that companies of all sizes are less likely to list than before. Moreover, the fall in public listings actually began several years before SarbOx arrived. So we look for additional systemic factors. Has globalization “stolen” American companies? Not really. The number of non-U.S. public companies rose quickly in 1990s and early 2000s. But the number of public companies worldwide – both including and excluding the U.S. – has declined over the last decade. The rise of intangible assets could be a big part of the explanation. In a knowledge economy, human capital and ideas are more important to business concerns than machines, factories and other forms of physical capital. Nowadays, many entrepreneurs can start up with a few employees, some laptop computers and an Amazon Web Services account. Businesses built on intangible capital may not need as much financing, and they may also be more attractive acquisition targets. Today’s large enterprises, in other words, may be more likely to buy people and protocols than competitive factories. The Internet also ties employees and business divisions more closely together, perhaps reducing Coasian transaction costs and allowing firms to grow larger than before. It’s also true that technology has improved the process of matching funding sources with growing firms. Thus one possible explanation is that the Internet has reduced the demand for public financing, increased the supply of alternative financing and enabled a smaller number of larger firms. Even the reduced number of Silicon Valley firms that do end up entering the public markets are waiting to do so. Many can raise hundreds of millions of dollars in venture capital, and it’s only when their private valuations show signs of wavering that they decide to go public. As a result, public investors often miss out on the opportunity to participate in the rapid growth phase of these companies. America’s broad and deep private equity and venture capital markets are a healthy phenomenon. Billions of dollars in alternative financing support thousands of start-ups and mid-sized firms in many industries. The growth of public and private valuations over the last decade suggests private finance can partly make up for the fall-off in public markets. But there’s reason to question whether this phenomenon can persist, and even if it can, if it is causing harmful side-effects. (1) Most investors cannot access the private markets, which are largely reserved for institutional and high-net-worth investors. Retail investors may have done well during the bull market in stocks. But will the lack of access to some of the fastest-growing businesses hurt them over the longer term? It may be time to reexamine the current rules that limit access to private markets and to think about new technologies and platforms that can responsibly “democratize” private investing. (2) If mergers and acquisitions continue to be more attractive than public offerings, corporate concentration may continue to rise. With diminished financing options and thus less competitive thrust, smaller entrepreneurial firms could be hurt – or even discouraged from starting up in the first place. Concentration could thus exacerbate the existing concern over sluggish business dynamism – the rate of net new business starts. Overall competition and innovation may suffer. (3) If, on the other hand, mergers and acquisitions slow down, and IPOs remain unattractive, the exit opportunities for venture capital and private equity-backed firms will dry up. The entire private financing cycle will come under strain. And if the markets that have compensated for plummeting public listings fall off, then the entire economy will suffer. (4) With very low costs and healthy diversification, index investing has democratized the stock market over the last 30 years. And yet the index fund managers have now grown so large that they have become attractive targets for political activists. If the public markets become politicized, it could further discourage public listing, further concentrate the markets, and reduce the funding options for firms and investing options for savers. With enough flexibility and growth in our private markets, perhaps we can withstand such a blow. A far better outcome, however, would be to reinvigorate our public markets, depoliticize them, and expand the options for firms and investors, which can only help support the private markets and help lift the broader economy.